SSC Group B & C Recruitment 2019 Exam (एसएससी ग्रुप बी और सी भर्ती 2019 परीक्षा – ऑनलाइन आवेदन, अधिसूचना) Recently, Staff Selection Commission has published the SSC Group B & C Recruitment Notification 2019 to conduct the Combined Graduate Level 2019 Examination on 04th to 19th June 2019. Candidates, who are eagerly waiting for SSC CGL Recruitment 2019, can fill the SSC CGL Online Application Form on before the last Date. The SSC is not announced the total number of vacancies for Group B and C but it will recruit the well skilled and energetic person. Eligible Candidates can visit the official website of SSC and complete the SSC CGL Vacancy 2019 application task. You can check all details about SSC Jobs from here. 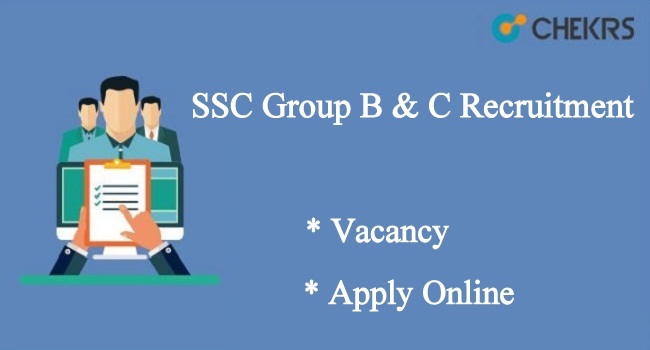 Latest Update: SSC is going to publish the Group B & C Recruitment 2019 Notification for various vacancies. Interested aspirants can fill the application form before the last date. The SSC is inviting the interested candidates for the Combined Graduation Level Exam. SSC has released the Group B (Non- Gazetted both Technical and Non-technical) and Group C (Non-technical) application form before the last date. Candidates are informed that they can apply for Online Registration before the last date. Every year, many candidates participated in SSC CGL Exam and get the selection. If Candidates are interested in Government Jobs then read the whole article and can get the details regarding SSC CGL Group B & C Exam Date. Chartered Accountant or Cost & Management Accountant or Company Secretary etc. The age relaxation for the SC/ ST Category is 5 years, 3 years for OBC/ NCL and 10 years for PH candidates. Go to the official web portal of SSC. Make a valid registration and login to the site. Check or Download the SSC CGL Recruitment 2019 Exam and read all information before filling the application form. Recheck the application details before submitting. Take a print out of application form after submission. The Staff Selection Commission will conduct the Group B & C Combined Graduate Level Examination Tier 1 on 04th to 19th June 2019. Candidates can Download SSC CGL Admit Card 2019 in the Last week of May 2019. The admit card is very important documents, so participated candidates must carry it. To get more updates about the SSC Group B & C 2019 Recruitment to keep in touch our web page which is www.jobs.chekrs.com. For any type of questions, you can contact us by commenting at the end of the post, we will respond to you as soon as possible.